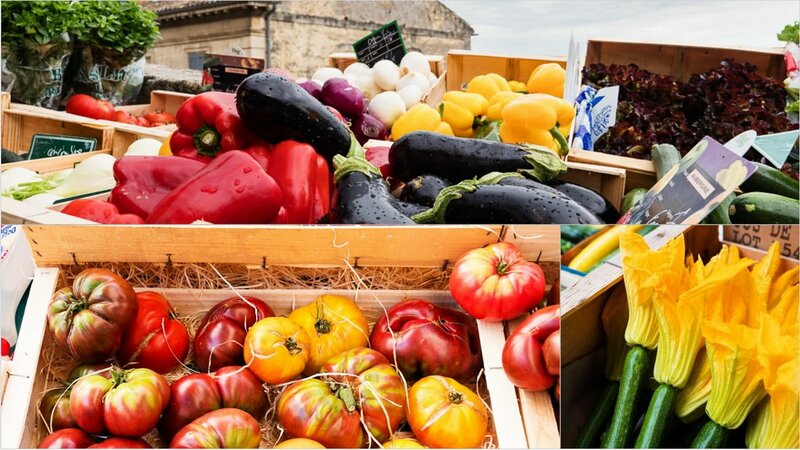 The farmer’s markets of Southeast France are the epitome of summer goodness: fresh herbs, fruits and vegetables, beautifully presented and a pleasure to eat. Best of all, though, the markets offer a truly Provençal experience, filled with local traditions. 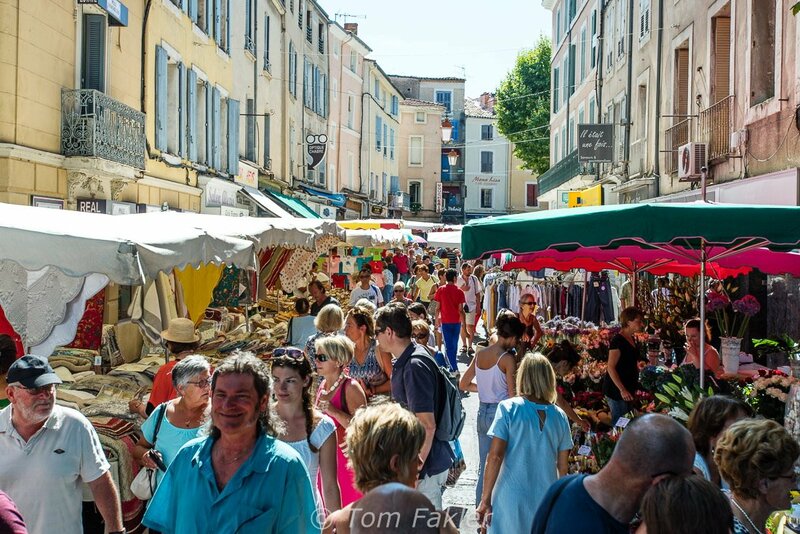 On our visit to Provence earlier this month, market day in Luberon provided an opportunity to re-live fine memories of our previous visits there, while making new ones. 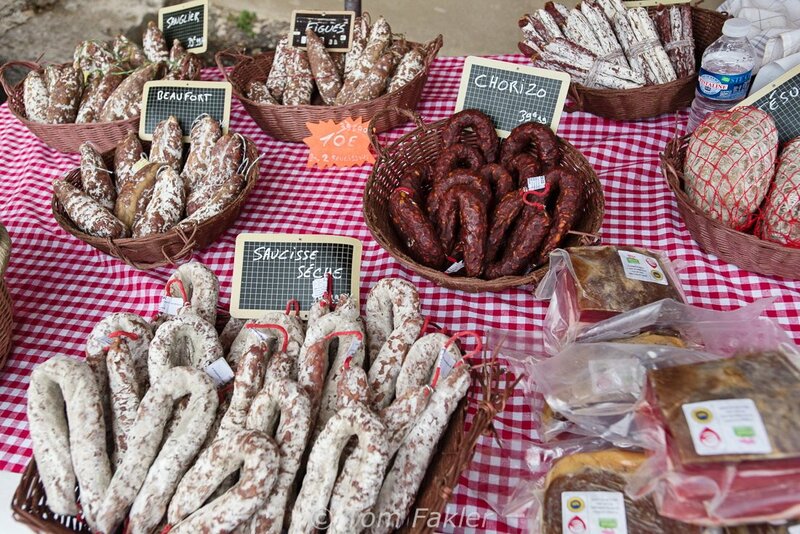 The region abounds in markets, large and small, and I can think of no better way to fill my pantry and scrapbook, than with (mostly food) memories from these Provence markets. Markets here have something for everyone. 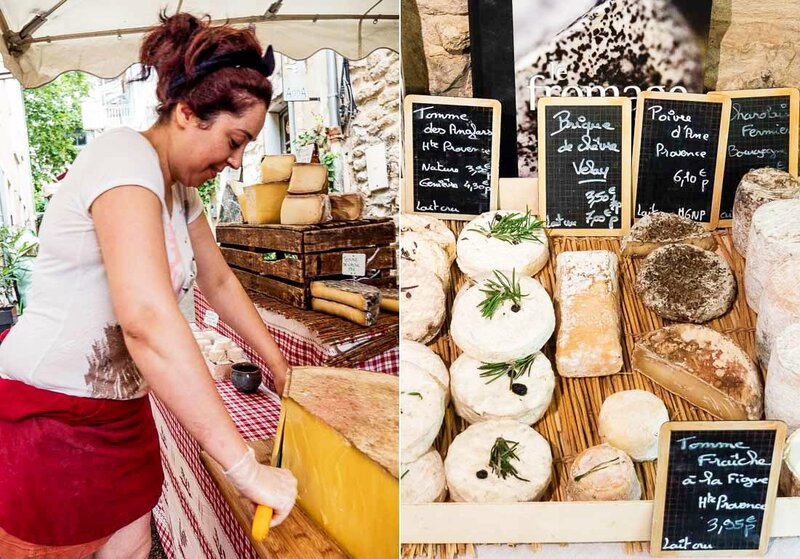 Here are six reasons market day in Luberon should be a part of any summer travel itinerary in Provence. 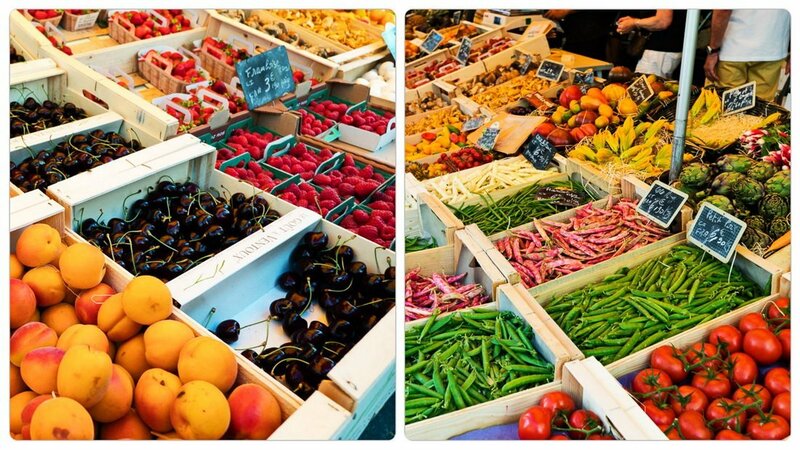 The fruits and veggies in Luberon markets are gorgeous. Those we sampled, from tomatoes to peaches and melons, tasted just-picked fresh. End-of-season cherries and luscious peaches begged to jump into a clafoutis. Just seeing dew drops on aubergine (eggplant) conjured up visions of ratatouille! Provence is goat-cheese nirvana. There are seemingly endless varieties: fresh cheeses, soft and spreadable; soft-ripened with edible rinds; and aged, for weeks or months and sometimes covered in ash. For Tom and me, the big discovery was a mostly goat cheese from Banon in Haute Provence: rich, tangy and serve-with-a-spoon creamy. Banon cheese is traditionally washed with eau-de-vie, and wrapped in raffia-tied chestnut or grape leaves. Sausages too come with a Provençal touch, and I brought home a link of cured pork sausage rolled in herbes de Provence. The scent of fresh lavender permeates the air in summer markets all over Provence. Local kitchens produce great lavender-flavored treats, to enjoy while shopping, or as take-home remembrances for the table. Try ice-cream flavored with lavender and peach, or lavender and chocolate! Take home lavender honey, jams and chutneys, or lavender biscuits for dipping in coffee or tea. The famous Calissons from Aix-en-Provence are flavored with melon, oranges and almonds. In lavender season, these gluten-free treats also come in shades of…you guessed it, lavender! 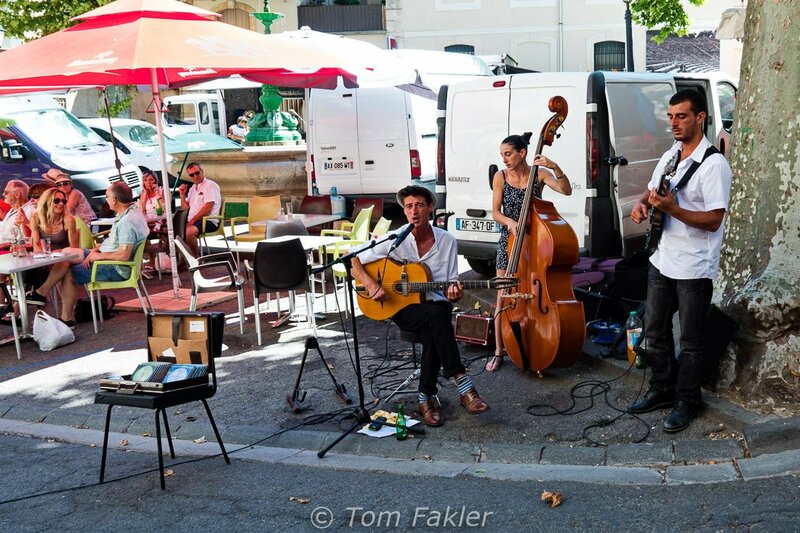 Street musicians are an added attraction at Luberon markets. In addition, the region celebrates the summer harvests with concerts, specialty markets , and festivals. These are a great way to taste Provençal foods at the peak of freshness and to experience local traditions–Camargue bullfights, anyone? 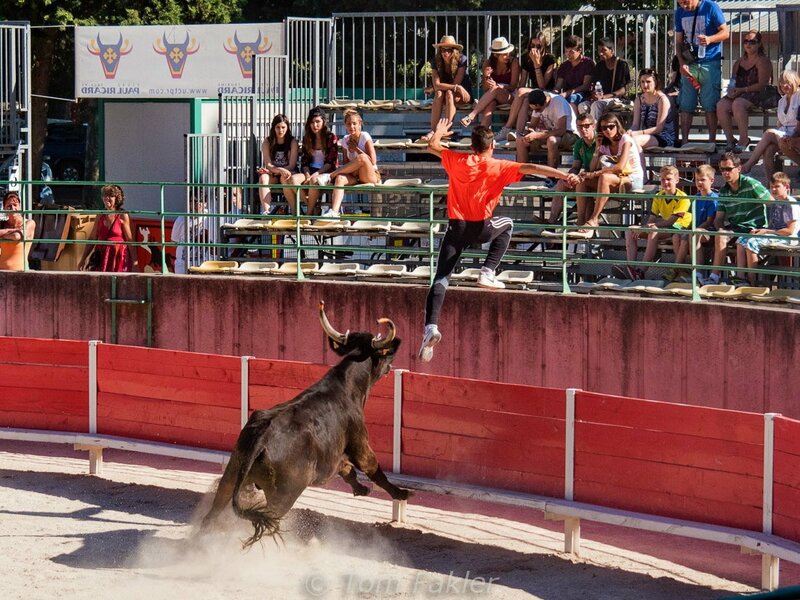 Camargue bullfights during he Melon Festival in Cavaillion give young men a chance to “dance” with bulls, as participants bet on how has the most staying power. The colors and aromas of Provence are most evident in the full intensity of summer. Need a bag to carry your purchases? Do it the French way, with a market basket like the locals use, perhaps in a contemporary style. They’re available in every market, and in every color. A table cloth to lay out a spread for dinner in the garden back home? Ditto. A sun hat ? 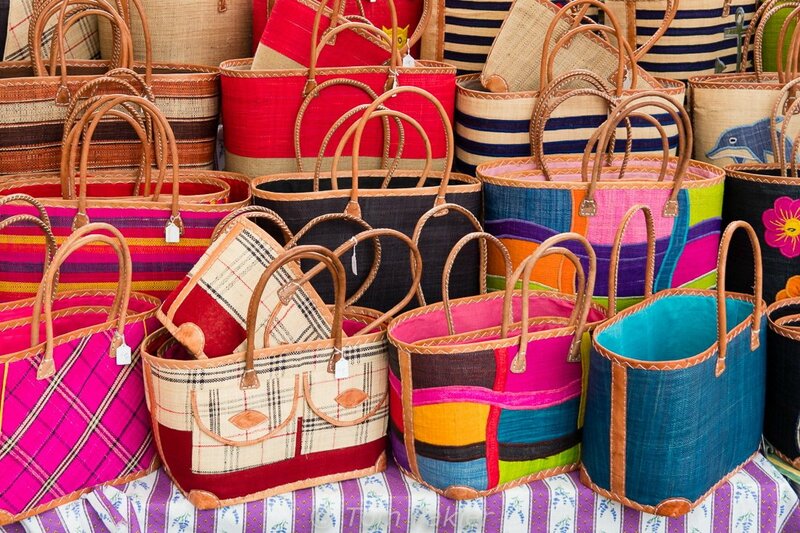 Every size and shape is on offer in these markets. 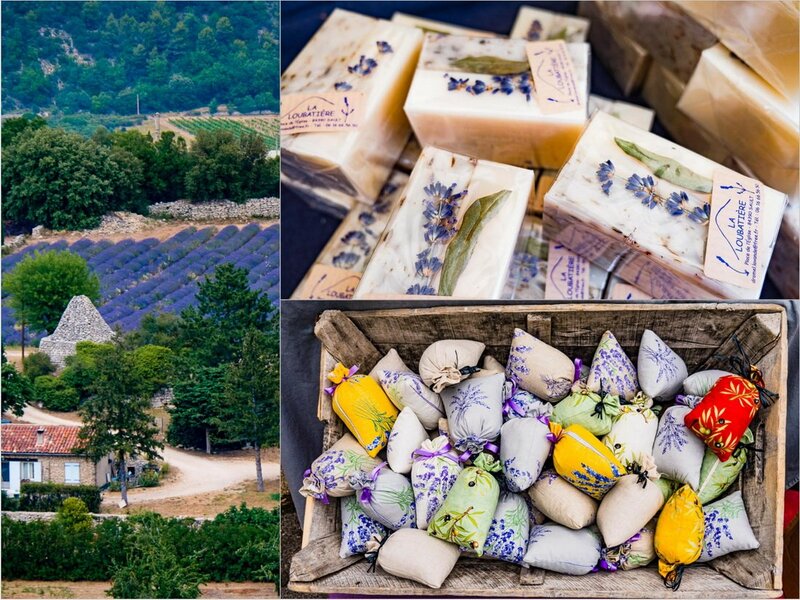 The hilltop villages of the Luberon are surrounded by lavender fields, and luscious soaps and sachets make wonderful aroma memories of Provence, as well as ideal gifts. I could not resist a few of each! One item I looked for in several markets, but did not find, was a lavender wand or fuseau. The handmade wands are woven from fresh lavender stems, with the blossoms folded inside, and are said to last a very long time. 31 August Update: A special thanks to our tour provider for an after-trip surprise: a fragrant little lavender wand, now making happy in my closet. Blissful travels indeed! 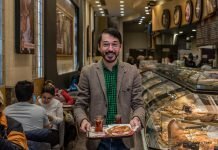 Many tourists join locals in the fray of the jam-packed Saturday market in Apt, and for good reason: it’s colorful, full of regional delights, and there are fine local shops to delight shoppers year-round. Apt is a good place to learn about some of the best products from across Provence, but it’s certainly not the only option. Smaller village markets from one end of Luberon to the other offer hyper-local produce (and a few of the same “foreign” goods) literally every day of the week. Some of them are jam-packed, especially at weekends, but the little markets in perched villages offer a more relaxed atmosphere. The Saturday market in Apt spreads throughout the center of town. Wendy Jaeger of Bliss Travels helps clients navigate the busy Apt market. Every market in Provence has its own character. 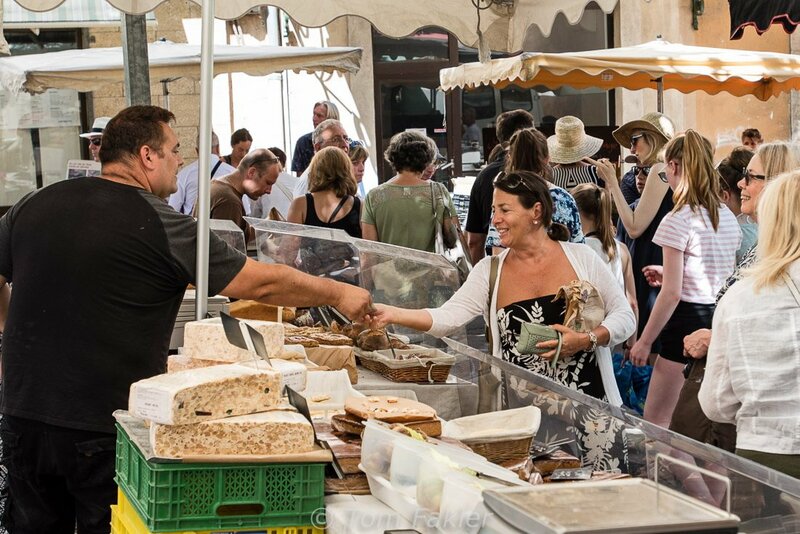 So, although you’ll find many of the products just about anywhere you shop, making market day a reason to visit a town or perched village can broaden your horizons and introduce you to friendly people with foods you’ll want to taste then and there. Visit a big market, such as the one in Apt, with someone who knows who top providers of local products, and can take you to meet them. Participants in a Bliss Travels Provence tour will delight in this extra touch. Take along some tissues and if you’re fussy, a little bottle of hand sanitizer, to clean up after tasting such delights as peaches literally bursting with juice. 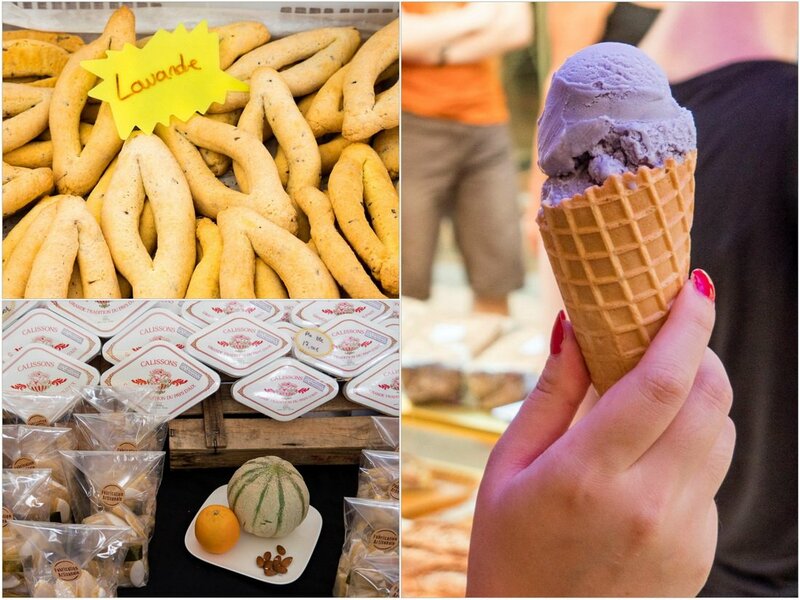 If you have an opportunity to visit a Luberon food festival, take it. Local farmers delight in sharing the bounty of their harvest, and the oh-so-fresh aromas and flavors are a feast for the senses. 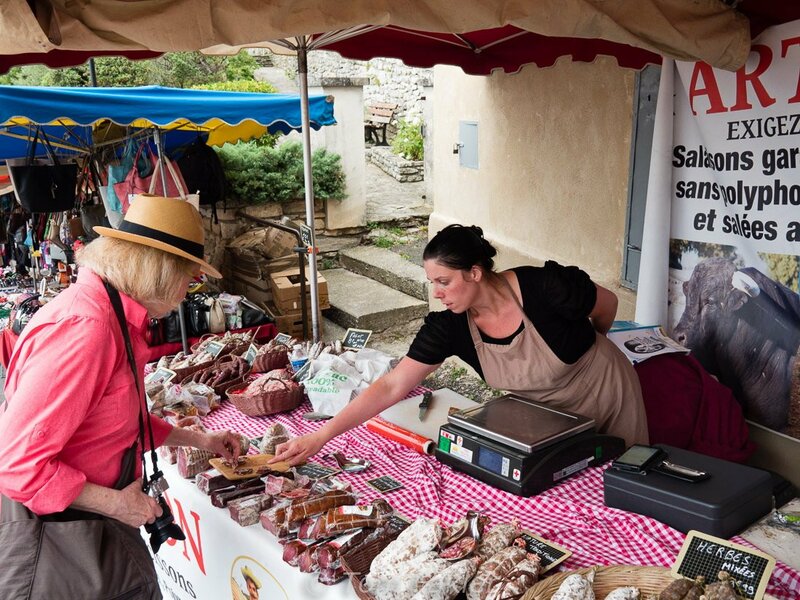 Check out a Luberon market-day calendar and set your travel clock! Thanks to Bliss Travels for introducing us to fabulous Provençal foods and wines, and for treating us to an especially enjoyable market day in Luberon! I always enjoy walking around food markets. Your pictures are lovely – I could almost taste that fruit! And lavender ice cream sounds wonderful. I think visiting markets is why I love Provence so much…and there’s one every day usually not too far from where you might be. Nothing like goat cheese but I’ve never had Banon cheese. I certainly love melons from Cavaillon! 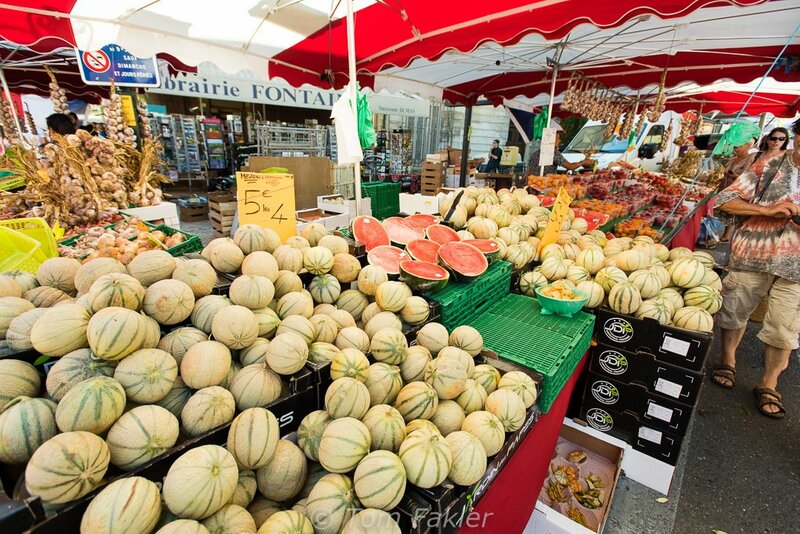 OH Jan the markets in Provence are marvelous…and Cavaillon melon time is the right time to be there! Anita I don’t even like ice cream, but that photo is oh so tempting. Thanks for the market photo tour of the Luberon, what a great chance to visit with Bliss Travels. Ah, Carolyne, thank you. That gorgeous lavender ice cream was not my favorite either…but everything else was! 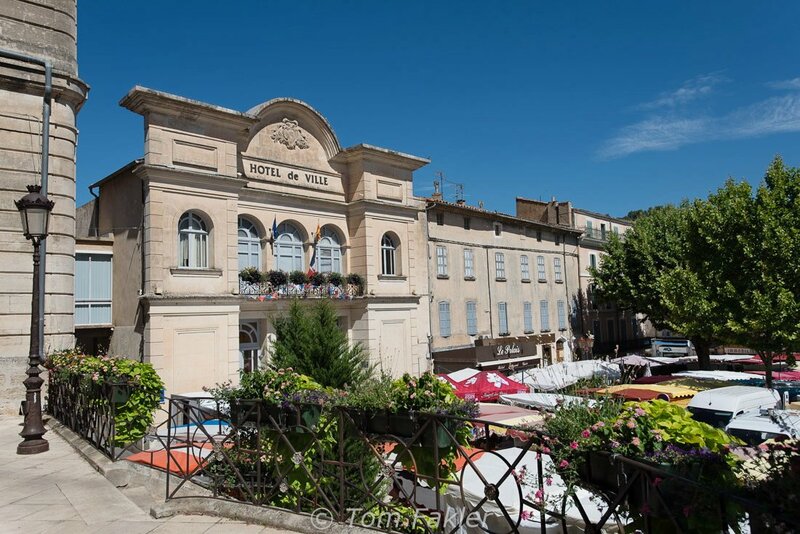 The markets in the Provence are beautiful and all have their own charm. I prefer more the smaller not touristy once as I like to skip the crowds. We drove through the Luberon last year and hit route Napoleon up to Switzerland. An awesome journey – one of our favorites. Lucky you, to do the Napoleon drive! It’s a beautiful region, and I can think of no better reason to break up the trip, than with market visits in Provence (or for that matter, all across France).